CUSO Guild Coverlets: They Make Great Gifts! CUSO Guild coverlets make great gifts for your family and friends who have a loyalty to the University of Illinois. 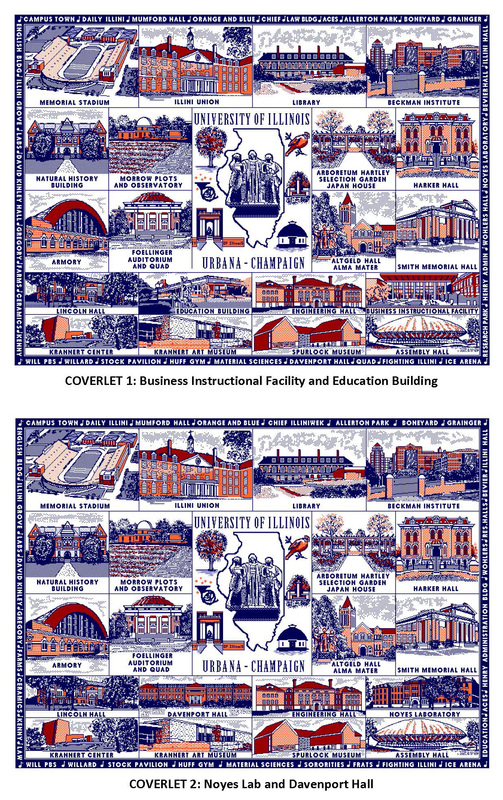 Coverlets depicting many of the famous buildings on the UIUC campus are now available and will be delivered to your home. These lovely coverlets are 50″ by 70″, 100% cotton, pre-shrunk, and machine washable. The proceeds from the sale of these coverlets provide continuing support for the programs and performances of CUSO and CUSO music education programs for the children of our communities. There are two coverlet designs, which have slight differences in buildings on each design, one including the Business Instructional Facility and the Education Building, and the other including Noyes Laboratory and Davenport Hall.